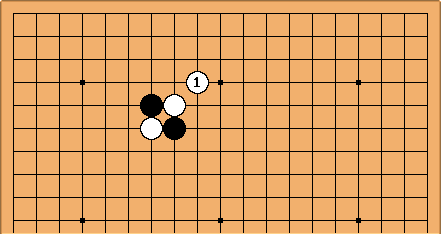 After a cross-cut in the centre of the board, isn't a recognised good shape. One can give some reasons. Supposing Black simply answers with . Then this is similar to the position in diagonal play reference positions? : White is at some disadvantage for influence. You could also say that threatens a good play at a. With this order of moves may also appear a little unreasonable. 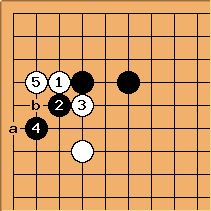 The same position arises here, though with Black to play. The 'correct' way to cut here is with at (strike at the waist of the knight's move). Tapir: I disagree. 1 and 2 are both the "waist" of the keima - afaik. However, if 1 at 2, 2 at 1, 3 cuts at the point left to 1, than 4 can capture the cutting stone in a ladder. It may be bad shape, but here without any other stones, it is not the wrong cut, but the only one. For all these reasons this is a relatively rare shape. An example can be see at Attach-crosscut corner patterns, in the 4-4 point case. This was played by Shinohara Masami against Go Seigen in 1935; it is hard to know how current is. This counter-example to the diagonal away move being a bad move has a reason. 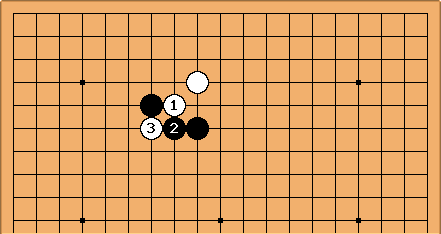 The main reason the diagonal move is bad is because on an open board after , the two black stones have bad shape, with a play at a a strong reason. However here a lies on the first line and so isn't a threat at all. Also, with a white stone bearing down, it is imperative that black can extend down along the side and for that reason must be preferred to b.